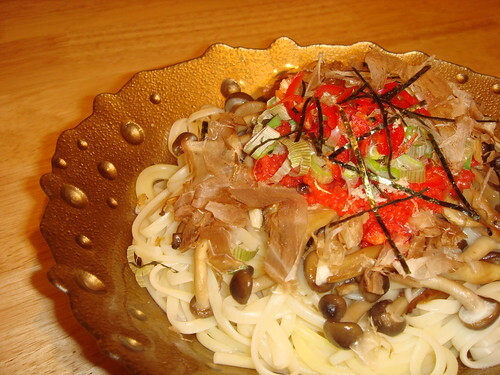 Wafu pasta or wafuu pasuta is the slightly bonkers, Japanese interpretation of Italian pasta dishes (wafu meaning Japanese style). 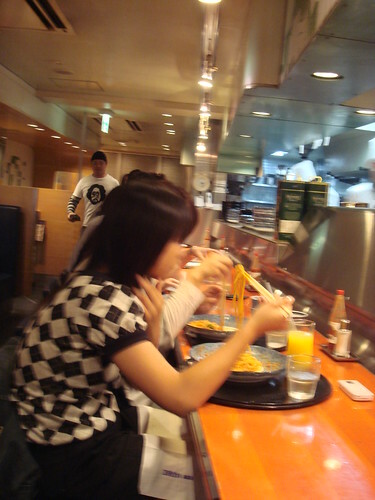 The first time we went to Harajuku, Japan (spiritual home of Gwen Stefani), hubby and I stumbled across a restaurant called Yomenya Goemon specialising in the stuff. 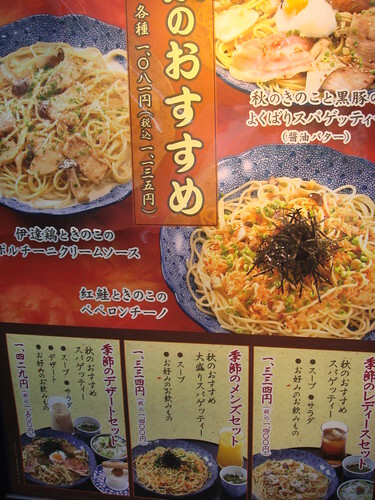 The spaghetti toppings would be familiar to those who love Japanese food, but might alarm those expecting tomatoes and basil, or pancetta and parmesan, eg there's a lot of uni aka sea urchin and tarako aka cod roe (though we never came across "cram"). 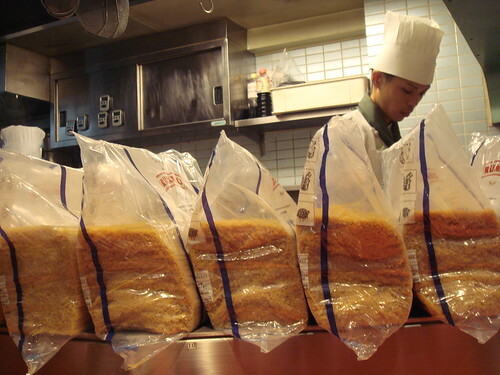 The staff had so many orders on the go at once that they had little magnetic timers going off to let them know when the pasta was done (though apparently Japanese people don't like al dente). Hubby plumped for pork, sesame and mizuna (see below), and I went for tarako and shimeji mushrooms (see pic at the top). It was really, really good, and we rather enjoyed using chopsticks instead of a fork to twirl the pasta strands around. Back home, I tried to recreate the dish I had (with added chilli!) and I loved it so much, and it's so quick, that now I'll eat it whenever I can. All the ingredients can be found at the Japan Centre, some Chinese supermarkets and even some bigger Western places like Waitrose. The best thing about Japanese spaghetti is that almost all the ingredients can be swapped for one equally delicious - I've listed a few alternatives below. 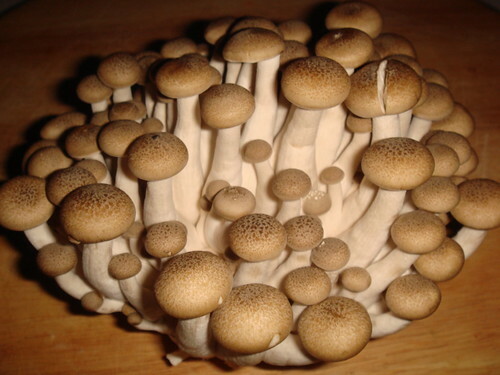 As for the mushrooms, there are lots of different types of shimeji, but I prefer to use buna-shimeji (beech mushrooms) - the chestnut brown ones below. 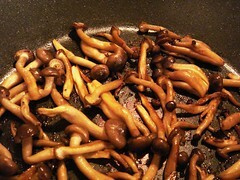 If using the shimeji mushrooms, slice about 1/2 inch off the bottom of the clump (discard this) to separate them. 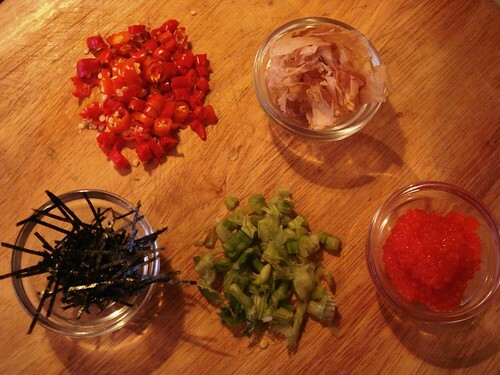 Next fry the shimeji in the tsuyu sauce or mirin mixture until soft. Cook the spaghetti, then drain and divide into two plates. Top with the mushrooms, the tarako/lumpfish roe/pancetta, the spring onions (and chillis if using) and lastly the nori strips and the katsuoboshi flakes. Drizzle olive oil all over, sprinkle shichimi pepper to taste and serve. Easy as pie and one of the tastiest things ever, as I said earlier wafu pasta can be adapted however you wish with any toppings you like, so long as it retains some Japanese flavour/spirit. Maybe you'll become as addicted to wafu pasta as me! This is completely mad and I love it! 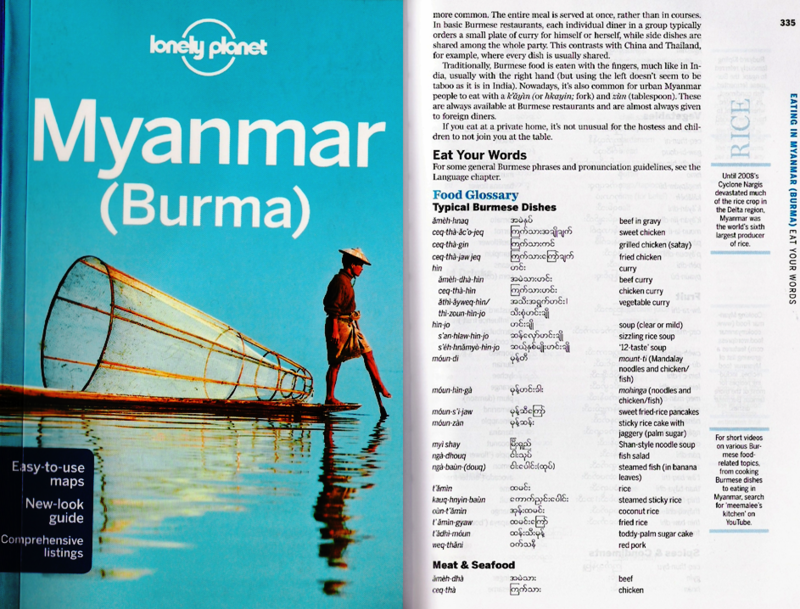 Will visit the Japan Centre soon. 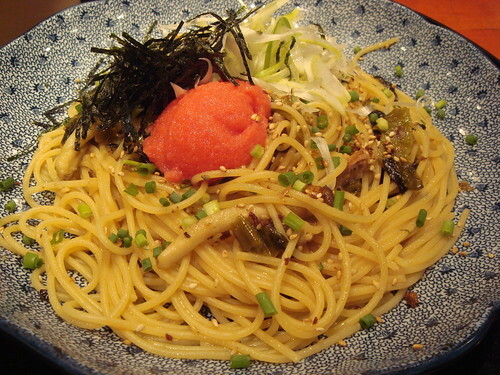 You could do a wafu pasta challenge - go to the Japan Centre, grab any three random ingredients and mix them with spaghetti. 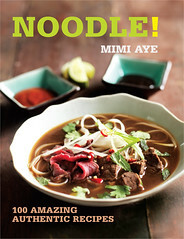 I reckon you have an 80% chance of coming up with a wicked dish! 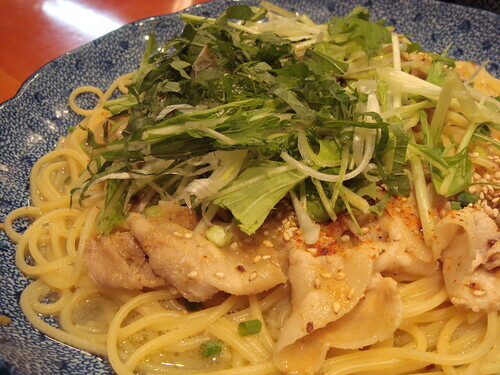 I loooooooove Japanese pasta dishes. I cook a creamy salmon Japanese pasta dish quite a lot but I would love to try more varieties. The pork dish looks really good. I will have to look out for something like that next time I'm in Japan.